If you read the news these days, you’ll see how many religious people still take the bible as the literal word of God. Don’t believe me? In 2012, Gallup surveys showed that 46% of people believed in the Bible’s view of the creation of the world. Just this month, Bill Nye held a debate about whether evolution or creationism was valid. Despite scientific evidence to the contrary, people believe the world was created in 6 days, and that what is written in the Bible is the law we should follow. This is still driving the debates these days on climate change, gay marriage, and a myriad of other subjects in this nation. Notwithstanding the Constitution, there are a large number of people who believe this should be a Christian nation, which Christian scripture as law. But this is nothing new: there were similar efforts in the 1950s during the McCarthy trials (remember “Godless commies and pinkos”), and even in 1925 with a trial over whether evolution could be taught in the public schools. That trial, the infamous Scopes Monkey Trial, pitted a former presidential candidate, Williams Jennings Bryant, against one of the best legal minds of the century, Clarence Darrow. 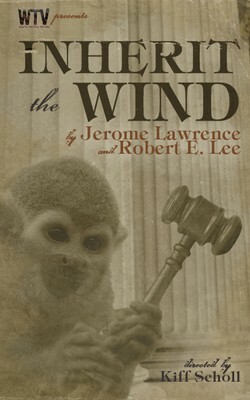 In the 1950s, Jerome Lawrence and Robert E. Lee fictionalized that trial as the play “Inherit the Wind“, as a warning against the witch-hunts that were going on with Sen. Eugene McCarthy in Washington. In 1960, the play was made into a classic film starring Spencer Tracy, Fredrick March, and Gene Kelley. When I discovered earlier this year that GTC Burbank (specifically, Wasatch Theatrical Ventures) was doing a production of “Inherit the Wind“, I wanted to go. “Inherit the Wind” is one of my favorite movies; I wanted to see the original. So I got tickets, and scheduled it for the afternoon of Purim (which, alas, was the last performance). For those unfamiliar with the story, John Thomas Scopes Bert Cates is put on trial in Dayton TN Hillsboro TN for violating a Tennessee law regarding the teaching of evolution. The bible-thumping community brings in Williams Jennings Bryant Matthew Harrison Brady to assist the local prosecutor. The American Civil Liberties Union Baltimore Sun hired Clarence Darrow Henry Drummond to defend Cates. The event was covered by famous journalists, including H. L. Menken E. K. Hornbeck of the Baltimore Sun (who also put up bail for Scopes/Cates). The play, as you can tell, incorporates much of the history, but does add some fictionalized elements of its own, such as a relationship between Cates and the daughter (Rachel Brown) of the town Reverend, or the timing of the death of Bryant/Brady (in actuality, Bryant died 5 days after the trial). As I said, this is one of my favorite plays/movies, so I urge you to read up on the trial, rent the movie, and discover how it really is timeless. The Wasatch Theatrical Ventures production, under the direction of Kiff Scholl, was excellent. Even with a simple set (more on that in a paragraph or so), the actors brought the trial to life. Much of this was due to the performances of the leads, Robert Craighead as Matthew Harrison Brady, and Mark Belnick as Henry Drummond. Belnick’s ability to play a convincing lawyer is no surprise, for he has a law degree and is a senior litigation partner and was Deputy Chief Counsel to the US Senate Iran/Contra Investigation. Craighead is more of a traditional actor, but also gave a convincing performance as one who believed wholeheartedly in the Bible and its unerring truth. Supporting them as the cynical reporter E. K. Hornbeck was J. Richey Nash, who was wonderfully acerbic and troublemaking, with a convincing attitude of “stir it up”. These leads were just great. In the second tier of characters were Robbie Winston as Bert Cates, Laurel Reese as Rachel Brown, Alan Brooks as Reverend Brown, Amir Levi as Tom Davenport (the prosecuting attorney), and Donald Agnelli as the Judge. Winston’s Cates was suitably subdued, but he handled his final statement quite well. Reese’s Rachel was very touching in her concern for Cates, and Brooks was suitably “fire and brimston” in his prayer meeting. Levi and Agnelli provided suitable court demeanor. Rounding out the cast were Steven Scot Bono (George Sillers), Scott Golden (Reuters Reporter / Jesse H. Dunlap / Esterbrook), Nicholas Goldreich (Bill Bannister), Dutch Hofstetter (Howard Blair), David Reynolds (Meeker / Elijah), Suzan Solomon (Mrs. Blair), Rosemary Stevens (Mrs. Brady), Rachel Werline (Melinda), and Edmund Wyson (Mayor). Of these, I’d like to single out Suzan Solomon, who had a lovely singing voice. The set for “Inherit the Wind“, designed by Adam Haas Hunter, was simple but effective. A basic wall with doors with appropriate evolution drawings, it was augmented with simple tables, chairs, and podiums to create an effective courtroom. This was supported by the great lighting of Michael Gend and sound of Matthew Richter. The costumes by Shannon A. Kennedy were appropriate and effective, and did a wonderful job of making you believe it was dripping hot. Amber Bruegel was the Production Stage Manager, assisted by Erica Lawrence. “Inherit the Wind” was produced by Racquel Lehrman and Victoria Watson of Theatre Planners. Alas, the performance we saw was the last performance of “Inherit the Wind“. Upcoming Theatre and Concerts: March 22 brings “Harmony” at The Ahmanson Theatre (FB), followed by “Author, Author: An Evening with Sholom Aleichem” at the Santa Monica Playhouse (FB) on March 23. The last weekend of March is open, and will likely stay that way as we’ll be exhausted. April starts with “In The Heights” at Cabrillo Music Theatre (FB) on April 5, and should also bring “Tallest Tree” at the Mark Taper Forum on April 12. The following weekend brings a benefit at REP East (FB): “A Night at the Rock Opera“. The last weekend of April will bring Noel Paul Stookey at McCabes, as well as the Southern California Renaissance Faire. Current planning for May shows “The Lion in Winter” at The Colony Theatre (FB), and “Cat on a Hot Tin Roof” at REP East (FB), as well as “Hairspray” at Nobel Middle School. June is mostly open pending scheduling of an MRJ meeting, but I will try to fit in as much of the Hollywood Fringe Festival as I can. As always, I’m keeping my eyes open for interesting productions mentioned on sites such as Bitter-Lemons, and Musicals in LA, as well as productions I see on Goldstar, LA Stage Tix, Plays411.